I love tea and I especially love Turkish çay. It has its own special ritual something akin to fixing cocktails at 6pm with its own clink of glasses and the sound of filling the kettle and then the wait. I think it all comes down to anticipation while getting those seductive little glasses out. By the way, did you know that they are affectionately known as Ajdas, after Ajda Pekkan, the iconic – and curvaceous – singer? Offering a glass of çay is part of the fabric of life here so you’ll find yourself sipping it at the butcher’s, in the bank, while debating the purchase of a carpet in the Grand Bazaar …Turks use çay as a social lubricant, a sign of their great hospitality, the thinking being that any situation will be better if tea is served. And so it is. But there is a huge difference between good tea and average tea, between brewed and stewed. 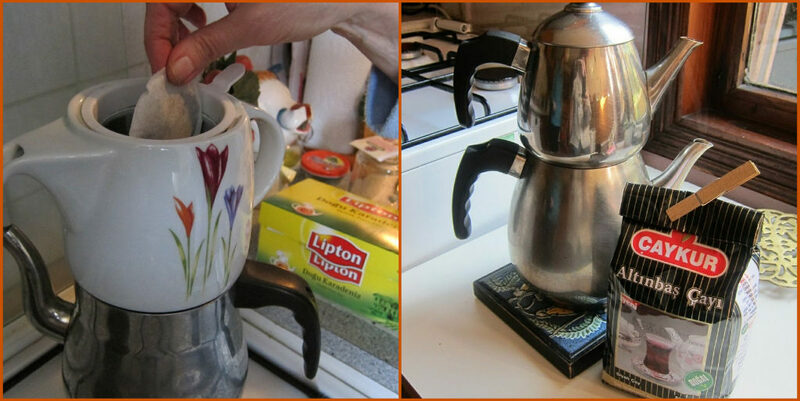 Not everyone can make good tea, not even Turks as they readily admit. 8 times out of 10, my çay tastes very nice but the other 2 times, it can be downright horrible. The skill lies in knowing how many spoonfuls of tea to put in the pot. So what do you need to embark on making Turkish çay? First of all, get yourself a nice çaydanlık seti: this is a set of 2 kettles one on top of the other like a Russian samovar. 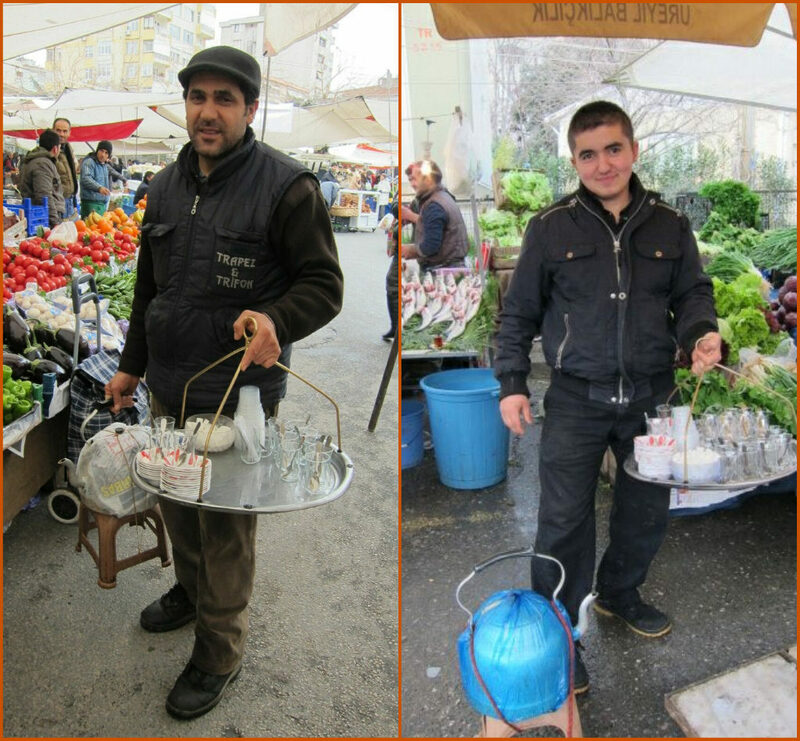 The smaller one on top is called the demlik while the larger one on which it rests is the çaydanlık. I am assuming that you have already succumbed and bought yourself a set of those enchanting tulip-shaped glasses with the little saucers. The best çay comes from Black Sea areas like Rize and the supermarkets have shelves full of different varieties. We like Ahmad Çayı which is a nice strong tea. 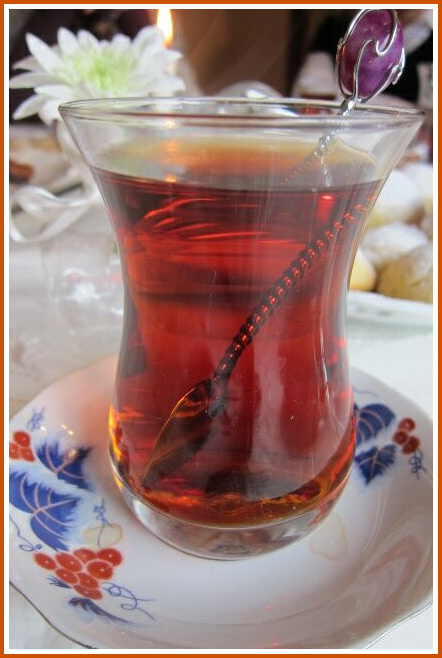 Turks are very fond of making their own blends eg by adding a hint of Earl Grey. Until very recently the best present you could bring a Turk was a packet of that oh so English of teas back from the UK. 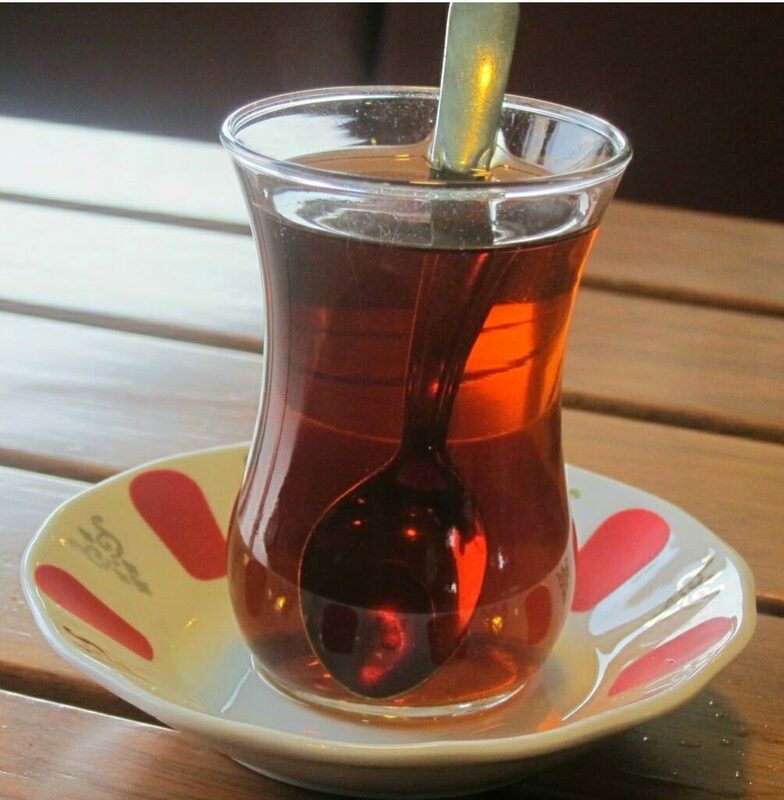 You will also see packets of demlik poşet which are special teabags made just for making tea in the Turkish way and are quite new on the scene. They are not instant like PG Tips. If it is just my husband and me, I will put one very heaped teaspoon each plus one for the pot just like we do with English tea, in the smaller kettle. The idea is that the leaves will warm while the water below is coming to the boil. When it does, you pour some on top of those leaves so it is quite liquid, and give it a good stir before turning the heat down and timing it 10 minutes. No more no less. I use a timer for this crucial part of the process! Too long and it will taste bitter. Never try to make English tea like this. Pouring the tea depends on how your guests like it: it is a good idea to ask. I like it demli which means strong but many prefer it açık or weak. So adjust how much you put in the glasses- a finger is about right -, and then continue filling from the larger kettle. When you finish pouring, don’t forget to top up both kettles. I use my electric kettle to boil more water speedily just for this. 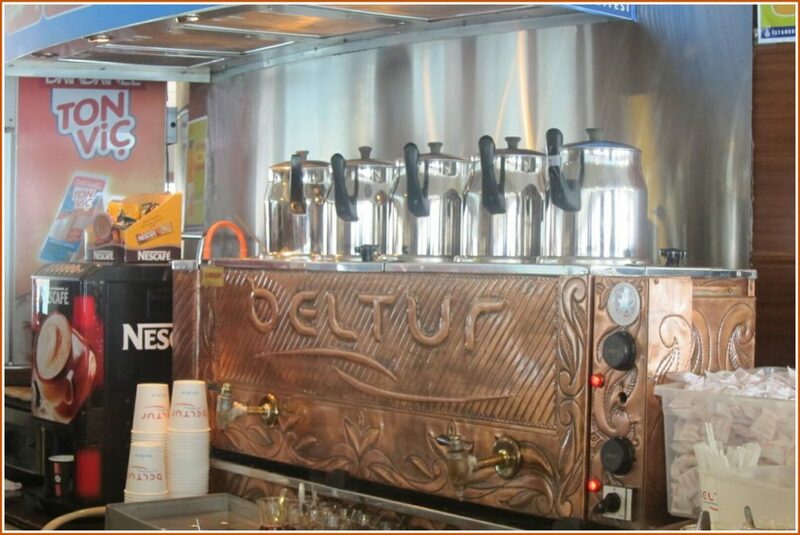 For large groups, many Turkish hostesses have 2 çaydanlıks on the go plus their electric kettle. notice the colour: tavşan kanı or rabbit’s blood! This is how it should be…. Colour is the thing: a good glass of çay should be tavşan kanı or the colour of rabbits blood! We aim for this but others might find it too strong. One of the greatest sources of pleasure or keyif in Istanbul is drinking çay on a vapur or ferry as you cross the Bosphorus on a sunny day with the seagulls swooping overhead, that unforgettable skyline of the Old City ahead of you and a tost or one of those delicious toasted cheese sandwiches in your hand. Don’t miss the opportunity! My other half loves Earl Grey so I imagine he would like this very much. 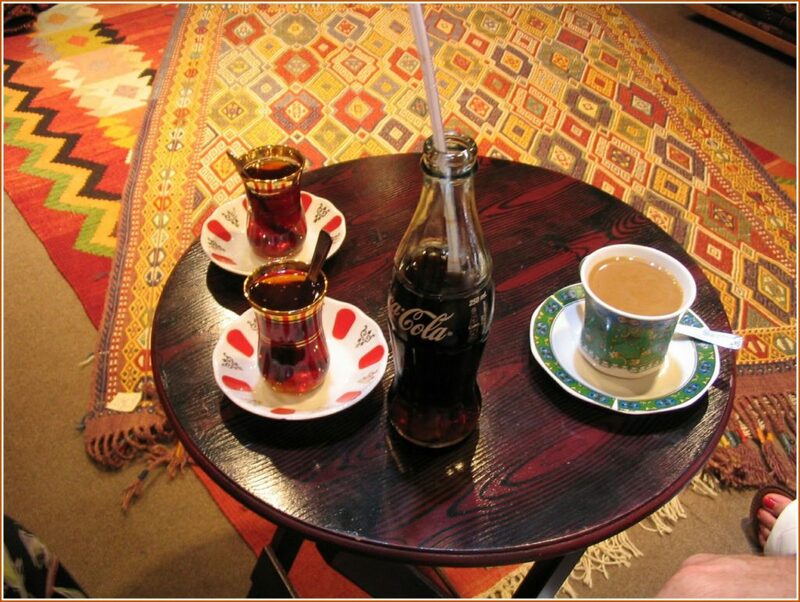 A lovely introduction to Turkish tea. I am your newest follower. I invite you to visit my blog and become a follower. This reminds me of the many Cays I have drunk whilst sitting by the side of the Bosphorus many years ago and I remember the market cycis so well too. I love the colour of cay too, almost like amber jewels.